Otter Voice Notes for Android is a voice note app that transcribes English conversations. The app enables you to record, transcribe, and share voice notes and turns conversations into searchable notes. It is an empowerment of communication and collaboration and makes the conversation sound more lively. It is most useful for business people, journalists and students. The app let them be more focused and efficiently handle interviews, lectures and other conversations. Otter collaborates and creates smart voice notes, which have an audio in line with photos, transcription and keywords. Otter Voice Notes Android app makes life easy for people who are always on the run. Record live all the little conversations that will help you, it could be meetings, interviews, lectures, speeches, ideas, and memos. Listen to them and share the transcripts. 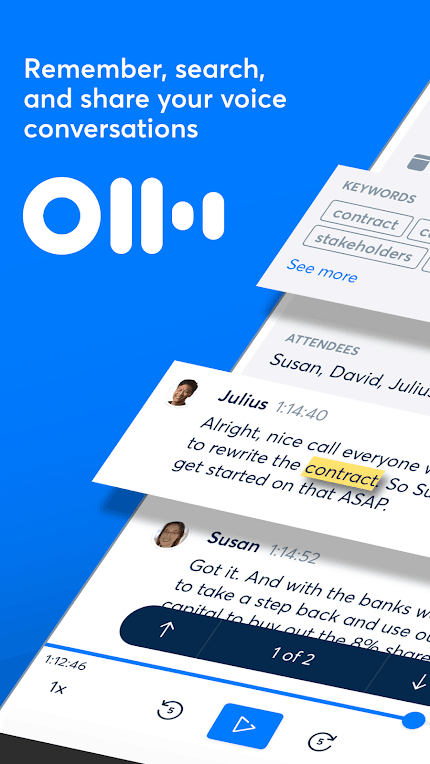 It is now easier to write minutes of meeting and reports as you can revisit the points you have missed in the conversations. Mark points that need review and further information. Create videos with pictures of whiteboards and slides. The built in mic allows you to record audio and sync it with the transcripts. You have prerecorded audio and video files; the app lets you import them. Otter Voice Notes app helps you take notes by automatically generating summary keywords and word clouds. Teach Otter to tag speakers automatically by tagging each speaker separately with edit paragraph breaks. Search filters let you search by keyword. Polish and edit the script before you can share. Group conversations can be recorded and shared with all the members. Also, share them via social media sites. Collaborate and work on the transcript. Otter Voice Notes for Android is quite private and secure that your conversations are never shared with others. Using artificial intelligence, the app successfully and efficiently manages to transcribe every single conversation with unlimited cloud storage to save them all. The app is free to download and can use up to 600 minutes every month. Otter Premium version gives you 6000 minutes of transaction per month with bulk export and more playback and skip silence option.